Discover new enrichment collections that will create a more engaging and collaborative learning environment and introduce students to the world in ways they never thought possible. Improve your library's capabilities in one seamless experience with Titlewave®, the most powerful online collection development and analysis tool in the world. Let us help identify the strengths and weaknesses of your collections and find the right library books and materials to fill gaps. You can also keep up to date with the latest digital content while developing a plan to ensure a stronger and more effective future for your library, or use our educational databases to provide students with easy access to award-winning research. Your first purchase is only the beginning of our new partnership. 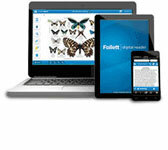 Let us integrate our products into your current system or help with library cataloging and processing. Our team of customer service experts is always ready to assist you with any challenge. We'd also like to invite you to participate in our training and eLearning professional development services.